Tampa Bay essentially lost the game with a pair of first-quarter turnovers, surrendering a 10-0 lead in the first quarter after two fumbles. 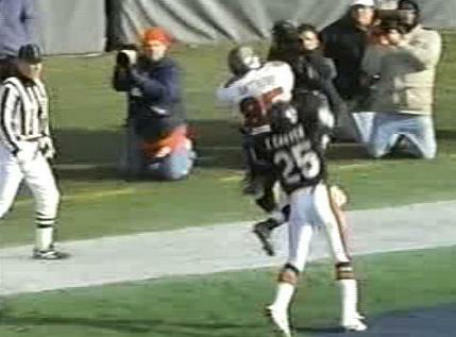 The Bucs’ very first play from scrimmage started the troubles when FB Mike Alstott fumbled and CB Walt Harris recovered. The Bears were only 1-10 coming into the game but shut down the Buccaneer running game all day and the only Tampa touchdown came as a result of a drive extended by a pair of Chicago personal foul penalties. 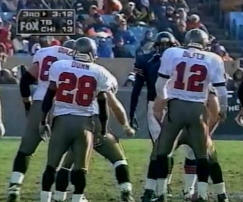 INDIVIDUAL STATISTICS RUSHING BUCS: Alstott 7-18, Dilfer 1-13, Dunn 9-4, Anthony 1-0. BEARS: Harris 33-116, Kramer 4-42, Autry 5-11. 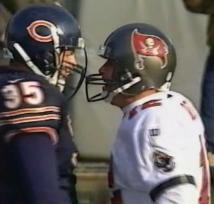 PASSING BUCS: Dilfer 33-19-247-0-1. BEARS: Kramer 28-15-110-0-0. RECEIVING BUCS: Anthony 4-59, Thomas 4-53, Harris 3-54, Williams 3-53, Dunn 2-13, Alstott 2-10, Copeland 1-5. BEARS: Penn 6-53, Bownes 2-23, Proehl 2-4, Allred 1-9, Jennings 1- 8, Wetnight 1-6, Carter 1-4, Harris 1-3. INTERCEPTIONS BUCS: none. BEARS: none. KICK RETURNS BUCS: Williams 3-62. BEARS: Bownes 2-54. PUNT RETURNS BUCS: Williams 3-40. BEARS: Hughes 2-15. SACKS BUCS: none. BEARS: Thomas 1-6, Simpson 1-4.